Trier lies in a valley between low vine-covered hills of red sandstone in the west of the state of Rhineland-Palatinate, near the border with Luxembourg and within the important Moselle wine region. Uniworld's River Queen docked overnight near Trier Harbor, along the head of the Moselle river. Where we begin on Sunday, June 18, 2017, with a city tour of historic Trier. As the oldest city in Germany, Trier blends the old and new history together seamlessly with the Moselle river. Trier was the largest Roman settlement north of the Alps, and had no less than six emperors ruling this Roman City. Remnants of the old Roman city still stand, and is designated as a UNESCO protected site. Other Roman remnants are the Amphitheater, the Imperial Bath, and Porta Nigra (the Black Gate). 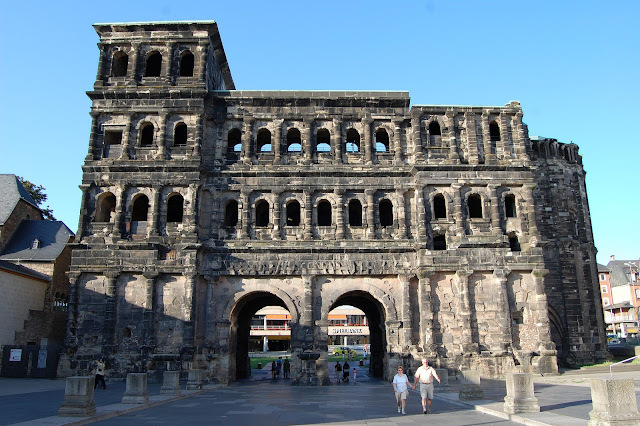 The Porta Nigra is a large Roman city gate in Trier, Germany. It is today the largest Roman city gate north of the Alps. We start our visit at the Basilica of Constantine, one of two basilicas built by Emperor Constantine in 306AD. This church was destroyed in WWII, as was 40% of Trier. The other basilica is St. Peter’s Cathedral - home of the Holy Tunic, a sacred relic donated by Constantine’s mother, St. Helena. On Friday of Easter Week, in 2012, Pope Benedict XVI’s special envoy Cardinal Marc Ouellet, presided over a ceremony opening the pilgrimage to the Holy Tunic, preserved in the Cathedral of Trier in Germany. The relic, piously believed to be the ‘seamless garment’ worn by Christ at the Passion, was exposed for the veneration of the faithful, for only the fourth time in the last hundred years. According to legend, the Holy Tunic was brought to Trier – at the time when Gaul was the capital. Notably another important fact, Trier is the birthplace of Karl Marx. The Karl Marx House museum is a writer’s house museum in Trier. In 1818, Karl Marx, the father of modern socialism and communism, was born in the house. It is now a museum about Karl Marx's life and writings. 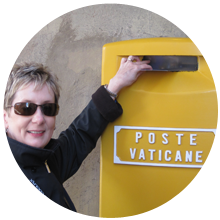 J. Christina is a personal travel blogger, writer and amateur-hobbyist photographer at Scribbles and Smiles. Living happily in the USA, married to John, aka, Mr. Christie. J. Christina is our bespoke identity in the blogosphere. Scribbles and Smiles by J. Christina is a means for others to travel vicariously through our blog posts, Instagram and Facebook. J.Christina has contributed to Bonjour Paris, FRANCE Today, The Good Life France.